Do you find it hard to sleep at night? Are you creative, but the juices just aren’t flowing? Do you find yourself feeling frazzled during the week or even during your downtime? What if we told you there is a type of yoga that slows down your body and mind to allow for total relaxation? You may already know a lot about other types of yoga, but you may not be familiar with restorative yoga. That’s why I’m here: to let you know a bit more about a practice that has helped me so much! Restorative yoga allows for students to hold a position between three and ten minutes. By taking that much time in any position, individuals are able to truly take a breath and find a place of complete relaxation through stillness. To help foster these goals, restorative poses or positions are passive, restful, and completely supported by props, which allows students to find peace. Many will poses, or asanas, that you see in a hatha or vinyasa class will have a complementary restorative variation. A restorative version of the same pose is generally more accessible for all levels. For example, bound angle pose, where students have the soles of their feet together and their knees toward the mat is supported by wrapping a blanket or strap around the student’s ankles and feet; blocks are added under their knees; and a bolster is used to either lean into or relax over. The goal is to have the body completely supported to allow for mental silence. Restorative teachers build classes not only around body muscles that need attention but also mental blocks. I have been to classes designed to help people address their posture, some to open students’ creative juices, and others to clear their minds to allow them to relieve their stresses. Long before I taught restorative or even knew about it, I stumbled into a restorative class as an injured runner. I used to run half marathons, but despite the distances, I was horrible about cross training and stretching. Before long my hips, knees, and legs were quite agitated. In trying to find a yoga class that would help alleviate the pain, I came across a class advertised for athletes and those who are hard on their bodies. I signed up and an hour and a quarter later, I could feel the difference. While at first it was only temporary, returning to that class and taking that time to help my body heal, relax, and find peace helped me get back to feeling better both physically and mentally. I returned to that class, every Sunday until I moved to Alexandria, Virginia where I found a new local yoga studio to restore myself. Now I restore my body from all of the cycling and walking I do. Whether you run, bike, or sit for long periods of time, this style of yoga is designed to help you reset. There are many opportunities in life and fitness to stress our bodies. It is easy to tell ourselves we will stretch when we get home or relax later. But we never do! Adding a restorative yoga class to your schedule will help you stay accountable. When someone is there to guide you and hold the space, the benefits are that much greater. Because of our hectic DC lifestyle, learning to sit still may be the hardest part, but you will receive the most mental gains and clarity from doing it. 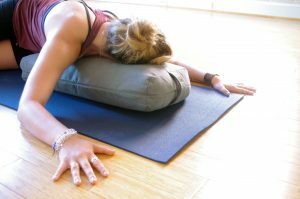 Restorative is more than fancy a name for athlete’s yoga, it’s the opportunity to center yourself, both physically and mentally, and to prepare yourself for your next day, opportunity, or adventure. Next time you are nearby the yoga studio, do not hesitate to ask any Refresh staff member about this unique form of yoga.